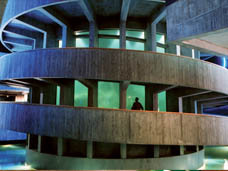 Stepping through the doors to the New England Aquarium on a brisk and sunny morning in early March is like crossing through a portal into another realm. As I enter the lobby, an omnipresent mist condenses immediately on my glasses. With my sight temporarily stolen, I take a deep breath and let the dense humidity linger in my nostrils and lungs while my glasses acclimate to the new atmosphere. My ears absorb a wash of calls from the exhibits within the aquarium; a deep murmur from a dark corridor to the left beckons through the mist, drawing me to the mesmerizing sea jellies; guttural skwalks waft through the lobby doors, advertising the delights of penguin interactions; calls of children’s excited exclamations to each other, promising of sharks and sting rays. Aroused by these sensations, a comfort in the familiar transports my mind to another time as well because we have a history, the Aquarium and I. Growing up in Massachusetts, trips to this harbor side sanctuary were much anticipated rituals performed annually with both my family and my classmates during field trips. As a teacher, I have continued this pilgrimage each and every year since with the students in my classroom. But today I return to this place with new eyes and a sharper focus as not merely a devoted admirer, but as a student and an observer. With nostalgic wonder that I venture down the dark corridor into the realm of the sea jellies. 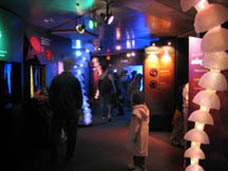 Inside the Amazing Jelly exhibit, it I first meet the moon jelly, Aurelia labiata, of the Pacific coast. This translucent variety of jelly is backlit by rotating red, blue and green lights. Swimming deep within their tank, the water is dark and their glowing bodies seem to roll in on themselves. They propel themselves through the water by contracting and expanding their bell in fluid, graceful motions. These motions ripple through to the hair like tendrils at the edges of their bells, drawing plankton from the water for food. With large bells that can grow up to sixteen inches in diameter, the four tentacles seem more of an extension of the lacy underbelly enveloping the mouth, stout in comparison to the bell. These moon jellies move in solitary patterns, each taking it’s own course, frequently bumping into each another like distracted commuters. Large individuals frequently knock smaller ones out of their way (not unlike the group of Canadian high school students jostling each other for a better view in front of the display). Throughout my visit through the realm of the Amazing Jellies, I encounter many varieties of jellies and learn that while there are similar characteristics between each of them, each variety and each individual is unique. For instance, most of the jellies move in similar ways to the moon jelly by contracting and expanding the bell in ripple-like movements that extend through the tentacles. However, the blue blubber jelly, Catostylus mosaicus, expands and contracts at a much more rapid rate. Different varieties travel about the water in different ways. Purple striped jellies, Chrismaora colorata, often roll along the bottom letting both their bell and tentacles brush against the bottom of the tank. Lagoon jellies, Mastigias papua float upside down on the currents within the mid range of the lagoon, away from both the surface and bottom. Both the Atlantic and Pacific sea nettles, Chyrsaora quinquecirrha and Chyrsaora fuscescens flow in a free flowing and wandering path. Some varieties exhibit very limited movement. The upside down jelly, Cassiopeia xamanchana, rests upon its bell along the bottom of the tank where it feeds among a colony. The Leidy’s comb jelly, Mnemiopsis leidyi, floats in the water seemingly unable to move. This diversity of movement is merely one aspect of the behavioral and biological diversity among sea jellies. In addition to variations in movement behaviors and patterns, not all jelly diets are created equal. While plankton is a dietary staple for most jellies, others supplement their diet in other ways. The lagoon jelly and upside down jelly enlist a symbiotic relationship with internal photosynthetic algae. The algae resides within the translucent body of the lagoon jelly where it is able to absorb sunlight and convert it into food. Both sea nettles and Leidy’s comb jelly eat fish eggs as a regular part of their diet. The carnivorous sea nettles even eat other jellies. 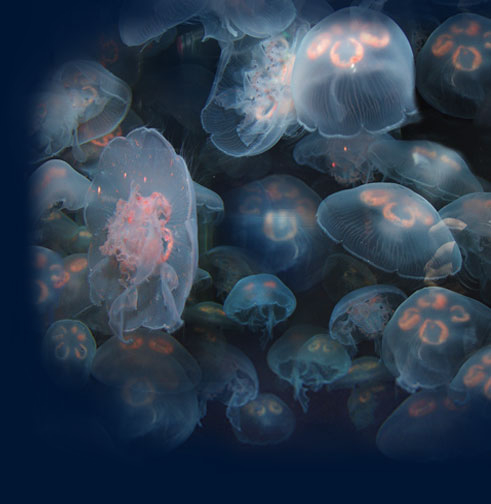 Depending upon the immediate environment of an area, varieties of sea jellies have adapted both biologically and behaviorally to fit within the ecology of their habitat. As I wander through the exhibits I am again overwhelmed, but this time not by the overall enchantment before me, but by the beautiful intricacies that lay in every square inch of each tank. When I first stumble upon those curious upside down jellies, I am fooled by the green color of the photosynthetic algae that lies within the tentacles and mistake the colony of animals for grasses or anemone. It is only when I kneel down before the tank and really looked closely that I see the jellies for who they are. My curiosity peaked, I have to jump up and glance at the placard posted above to confirm that my revelation is indeed correct (it is here that I learn of the source of their camouflage). Kneeling once again before the tank, dozens of students pass above me, taking brief peeks into the tank before passing on to the next. Some even call out, “I don’t see any jellyfish!” I have to smile to myself as I gaze at the jelly villagers before me and I am glad that I took the time to meet them. The ambience of the central exhibits sharply contrast with the peaceful darkness of the Amazing Jellies. I am appreciative of the time within the soothing darkness to orient my sight to see the world within the tanks and feel prepared to tune out the noise of bustling children and frolicking penguins. 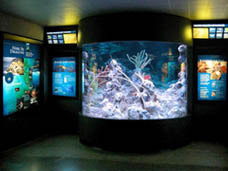 Two spiraling paths wind their way up and around a Giant Ocean Tank, complete with a four-story, Caribbean, coral reef. Sitting at a center level window I try to take in the community before me. Several four foot long tarpons, Megalops atlantici swim by my window following the current. Swimming together in a group of five or six, their large silvery bodies coast through the water in between gentle fin twitches that sustain their speed. As I refocus behind the mammoths in front of me I spot several smaller fish darting in and out of the reef, but before I can really focus on them, my view is quickly blocked by two tiger sharks, Galeocervo cuvier, gently gliding by my window. Their sleek bodies are gently propelled by a casual swish of their rear ends. As the sharks pass by graciously, several schools of medium sized fish come against the current, each individual swimming as a component of a larger coalition darting about in unison. Gray cartilage once again blots out my view as a cownose ray, Rhinoptera boansus skims the edge of the glass rubbing his belly and mouth against the window. While pressed up against the glass, his mouth ripples, searching for food that may be adhered to the glass. The flat body ripples in a graceful rhythm that reminds me of my recent friends the sea jellies. As the tarpons return for another pass by my window I notice that they all are swimming in the same direction as the sharks. Their path is purposeful and unwavering as smaller fish seem to move out of their way. The only thing that seems to divert their course is the bubbles from a passing diver’s scuba gear. Soon a loggerhead sea turtle, Caretta caretta, ambles by the window. His bulky shape and disproportionately large head sharply contrast to the sleek physique of the fish that have swam by before him. He propels his large body forward with his hind flippers while using them to steer, similar to a rudder. He is swimming downwards and against the traffic of the other fish making little use of his front flippers. His head turns from side to side taking note of obstacles in his path. As he encounters the tarpons he maneuvers around them but seems oblivious to the smaller fish that brush against the back of his shell and even pick at any stowaways. 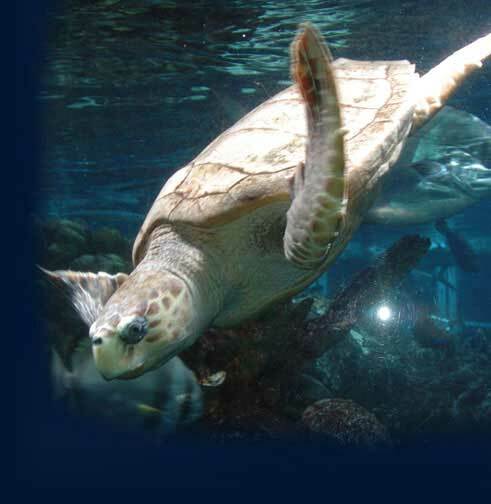 As he nears the bottom of the tank, he changes course and turns back upwards towards the surface. His front flippers come in handy now as he uses them to pull himself upward; his hind flippers have taken on the vital role of a rudder. As he nears the surface he begins to use all four flippers, suspending himself in front of a window. Turning towards the window he gazes at the people admiring him. He moves back and forth across the glass as if he is passing from person to person. This interaction continues until Myrtle, the green sea turtle, Chelonia mydas, a much larger turtle, bumps him away from the window and out of my sight. Apparently Myrtle wants it to be known that she is the queen and star of the center tank. Following my excursions into the depths of a coral reef, I decide to change course and head for the more local Eastport Harbor. Here I encounter several intriguing invertebrates native to my own New England. Several northern red sea anemone, Tealia felina, sat upon the sandy bottom of the tank. These brilliant reddish orange colored creatures consist of a slug like trunk a few inches in diameter with long, tentacles as thick as those of the upside down jelly, extending out the top in concentric circles. Most are at rest with their tentacles limp and at their sides or withdrawn into their trunk as they are likely nocturnal. One however is active and its tentacles waft in the water in fluid unison. The tentacles periodically curl their tips downward collecting plankton from the water. On nearby rocks, stalked tunicates, Boltenia olvifera, sit atop rocks seemingly affixed to the rock by root like structures. Atop the stalk, an orange pod waves in the water bumping. The pod has a small circular opening which fills up with water and nutrients as it is jostled by the currents and tides. One tunicate appears to be supporting an orange footed cucumber. Small clusters of green sea urchins, Strongylocentrotus droebackiensis also share these rocks. These creatures are round mounds of pinkish flesh housing hundreds of greenish yellow spines. These spines move independently wafting in the water, each curling in periodically to deposit any plankton recovered. Several clusters sit with horse mussel shells atop their backs. Nestled between a rock and a horse mussel, a daisy brittle star, Ophiolpholus aculeata, extends two arms up with brick red stripes and hundreds of tubed feet waving in the water and collecting food. These feet are so small they make the tiny striped arms look like they are covered in hair. Leaving the coastal waters in search of bottom dwelling fish, I come across a dark tank that at first glance looks empty. I wait for my eyes to adjust to the darkness and scrutinize the tank further and gasp as my eye comes across what appears to be a dead fish, several times the size of my head, lying on the gravel. I quickly turn around to see if anyone else is there, did you just see what I saw? But there is no one. I look back more closely as my eyes refocus and I examine the fish before me. Protruding slightly from the body, a brilliant blue eye gazes out of the center of the front of the body. Soon I noticed that just to the left (what I assumed to be towards the top of the fish) a similar protrusion. Repositioning myself to get the benefit of a different perspective, I can see that this is another eye and I suddenly understand that I have just succumbed to the tricks of an Atlantic halibut, Hippoglossus hippoglossus. Were I a predator, I very well might accept my initial impression and leave this master of disguise alone; were I a scavenger I might make this same assumption and move in for a meal only to become one myself. In the tank next door, a goosefish, Lophius americanus, lies just as patiently atop the gravel sea bottom. Unlike the sleek scales of the halibut, the goosefish has a rough and jagged exterior and looks to be housing several barnacle like organisms making him look like a large rock on the sea floor. Between his eyes, a spine protrudes out into the water dangling just above his slightly open mouth, enticing fish to come take a bite. Like the flat halibut and goosefish, the eel pout, Macrozoarces americanus, also lies in wait along the gravelly bottom. His long eel like body gives rise to his popular name but prevents him from utilizing camouflage in the same way as the flat fish. Instead, he lies curled around himself in a dark corner created by the walls of the tank. While he is unlikely to find this precise kind of niche on the actual ocean floor, I can imagine him taking shelter along rocks. His mottled pattern of dark olive and gray would help him to appear as an extension of a rock. There he would be able to patiently wait for crustaceans to amble by and present themselves as dinner. It is remarkable the ways that these three fish have evolved physically to blend into their surroundings and the incredibly patient behavior that they have assumed in order to maintain their sustenance. As the bottom dwellers have evolved to blend into the rocky bottom of the sea floor, coral reef fish of both tropical and northern reefs display a remarkable variety of protective coloration patterns. Camouflage and the ability to blend in with the environment plays a key role in much of marine ecology. In the northern coral reef, the scrawled filefish, Aluterus scriptus, have evolved to avert pretadors’ attention with wavy lines that help them to blend into the textures of coral and rock as well as changing colors. The Atlantic spadefish, Chaetodipterus faber avoid unwanted attention largely because their jagged striped pattern that enables them to blend in with the leaves and debris found in shallow waters. The lookdown fish, Selene vomer, relies on a dull silvery color to detract attention in addition to his ability to turn sideways and nearly disappear due to his narrow body structure. These northern reef fish have adapted to the dark colors of the temperate reef. In tropical reefs, the colorations are much more vibrant to provide protective coverage within the bright backdrop of diverse corals, sponges and anemones. The saddle wrasse, Thalassoma duperies, exhibits several of the dominant colors of his reef habitat. His bluish head is framed with a broad reddish orange stripe that passes behind his eye and under his front fins. The bulk of his body is a greenish color with speckled patterns that mirror the textures of the reef around him. As he darts in and out of the coral, his body frequently blends in and disappears. It takes several minutes and six shots to try to capture an image of this elusive creature as he continually fades in and out of view. The threadfin butterfly fish, Chaetodon auriga, relies on coloring for protection in a different way. Rather than blending in with the surroundings, this mostly white fish uses a band of black and yellow to confuse predators. A slim black band near his mouth masks his back eye. His yellow tail fins feature a black spot near the top of his body that serves as a decoy eye for any predators attempting to sneak up behind him. Having explored the camouflage within the northern Atlantic reef, I take off in search of the true masters of disguise, the sea dragons. As I wind my way down the spiral tank, I am struck by an intricate lacy creature floating in a glowing tank. Intrigued I approach the billboard to discover that these are in fact the elusive sea dragons I have been seeking. The curvature of their body mimics their relatives the sea horse, but these creatures exhibit plumage that is almost identical to the seaweed within the tank. They float through their tank as if they are indeed a piece of seaweed drifting in the water, meanwhile, their discreetly hidden tube like snout is feeding all the while. There are two varieties of these in front of me and I am mesmerized by their intricacy each one as beautiful as the other. The leafy variety, phycodurus equus, is larger with more pronounced “foliage” while the weedy variety, phylloperyx taeniolatus is smaller and thinner, nearly disappearing when faced head on or from behind. I am again reminded of how much I could have missed were I not paying such close attention. Returning to the bottom dwellers, I look for something that I have missed before, for by now I am sure that there is always something. Sure enough, my friends the halibut and eel pout have a roommate peeking up from underneath the sea bed. A horseshoe crab, limulus polyphemus, lies in rest under the sand as he likely is hunting for food within the seabed as his legs mouth and stomach all lie beneath the three part shell. Living alongside the halibut and eel pout the horseshoe crab’s shell merely adds to the topography of the sandy bottom enhancing all of their camouflage successes. After examining his shell for a few moments the back “blade” twitches slightly and I can see the partitions of his shell rub against each other as he lifts his body for a brief moment before settling back into the sand. Brimming with curiosity of what else I have missed, I glance at my watch and find that my time has run out and I must go. As I think of my next pilgrimage with my classroom of preschoolers I wonder if I will still usher them through, passing each window with a moment’s attention and I realize that I cannot; I will no longer be able to gloss over such rich intricacy and diversity. I will dwell with my students draw their eyes inside the tanks, share my experiences and provide opportunity for them to have their own; but above all, I will teach them to see as I have learned to see today. In many ways the sight that had been stolen from me upon entry into this sanctuary has been replaced with a lens of newfound acuity that has revealed the universe within my sanctuary. Stepping back out into the bright daylight and brisk, winter sea breeze I pause and turn to marvel at the sanctuary behind me. Although there have been expansions to the complex since my childhood visits, the building seems small compared to the monolithic temple that lies in the recesses of my memory. I smile to myself at this perception, because it so sharply contrasts with the vast spectrum of life that I have encountered within. Somewhere in the corners of my brain, murmuring like the deep voice from within the realm of the jellies I can hear my ocean environments professor, George Buckley’s repetitive reminders that there is a universe within every postage stamp and I think I finally understand.